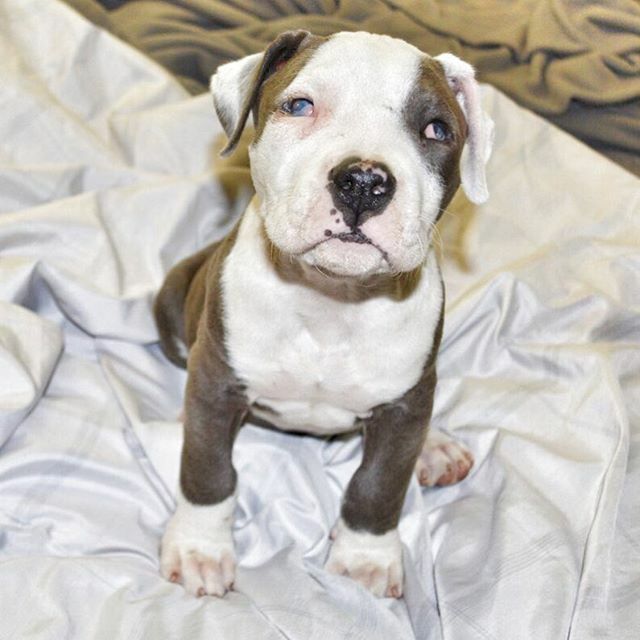 Murdock is a blind, nine week old pup and was thankfully taken in by Fresno Bully Rescue. He's generally in good health, but has been diagnosed with something called Micropthalmia (which basically means his eyeballs never grew with the rest of his body). It could have been something the mom ate while pregnant and pup was in gestation that caused his blindness, but we don't know for sure. Though he is essentially blind, there is a possibility that he might be able to see a little bit of light. At this time, the vet thinks there is no need for surgery to remove his eyes unless they start to cause him pain, and based on his demeanor and attitude, he does not seem to be uncomfortable at all. He has a small swelling in between his eyes from a small puncture that we are treating with occasional hot compresses. Other than that, his heart and lungs are strong and he is an extremely brave and happy puppy. Murdock has no fears. At times his blindness is hardly noticeable when watching him play and act like a regular pup. He definitely does not let it stand in his way and, though he may need a little extra guidance occasionally, Murdock truly lives life to the fullest. As Murdock matures, we will continue to see how his personality unfolds and share our special moments with his fans on Twitter & Instagram. To apply to adopt Murdock, read about Fresno Bully Rescue's requirements, or donate to his vet care, click here. View Murdock's gallery while in our foster care by searching the hashtag #MurdockThePit.